As we are immersed in the holiday season, many of you are probably making plans to come home for the holidays. And, although some of us never moved very far away, there is always an excitement in the air about traveling to Mom and Dad's or Grandpa and Grandma's house (even if its just a few miles away) for Christmas. Maybe it's the food, maybe it's the fellowship, maybe it's a rousing game of cards, or maybe, just maybe, it's the idea of being home. The idea of comfort, peace, love, warmth and someone to watch the kids while you take a nap. As a total package, it all sounds good to me. Do you have a special holiday tradition? My husband's family celebrates on Christmas Eve by attending church and enjoying a prime rib supper and gift opening afterwards. This year, my son has the privilege of being Baby Jesus in the live nativity at their idyllic country church. The little guy hasn't even made it out of the zeros yet, and he is being asked to fill some pretty big shoes. My husband and I are Mary and Joseph, which is quite an honor for us. The live nativity is a holiday tradition that dates back many years at their church, and even features a live baby lamb to accompany the shepherds in their journey. I thought my husband was kidding about the live animals the first time he invited me to attend the service with him as we were dating. It was no joke when that little lamb starting bleating for its mother in the middle of the nativity story! I have truly enjoyed being a part of this Christmas tradition and being able to accompany my husband at his "home" church. No matter what your tradition or where you call home, just enjoy the time you have together. In the grand scheme of things, it is far too short, home isn't ever that far away, and Christmas only comes once a year. Happy Holidays and Welcome Home. December is a Great Time to Buy! Let me give you something to consider today: December is GREAT time to buy a home! Don't call me crazy until you hear me out. 1. Only a serious seller will contend with selling their home during the holiday season. You don't have to mess around with sellers who are just "testing the waters." 2. Sellers tend to be more negotiable on prices during the month of December. Consider it a direct result of being in the holiday spirit. 3. Viewing homes with Christmas trees and other Christmas decor up gives you an idea of how big a space really is because those items typically do not occupy a room at various other times of the year. 4. Historically (and with the exception of the past week), temperatures average between 20-30 degrees and snow fall amounts are fairly light for our area until after Christmas. This helps to make moving a little easier when compared to January and February when snow falls are typically larger and temperatures colder. 5. Fewer buyers are in the market for homes which motivates sellers to strongly consider any and all offers. Your odds of buying a house improve as the market shifts in the direction of a buyer's market during winter months. If you've been holding your cards close to your chest, you might want to consider taking a look at some homes to see what kind of deals might be available this month. Wonderful opportunities await you in the local market to bring you home for the holidays! 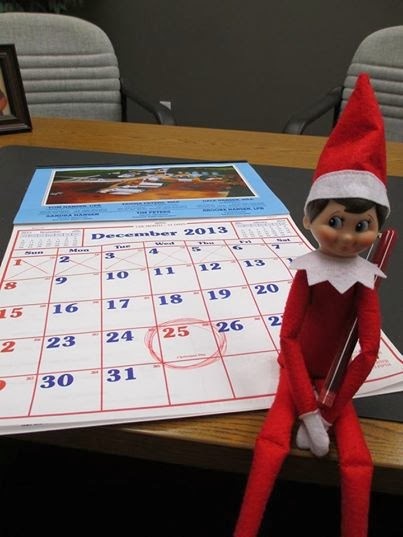 Also, don't forget to participate in the1st Realty Elf's Christmas Tour of Homes promotion taking place from now through December 24th! It is a great opportunity to preview our listings and win yourself some holiday cash courtesy of 1st Realty Sales & Management. Here is the link: https://www.facebook.com/events/591259154277665/. Happy holidays from all of us here at 1st Realty! Welcome Home! It's hard to remember how long it has been since we had a day like today with a steady, gentle rain all day long. Today is the kind of day you feel like making a big pot of soup and napping on the couch in between made-for-TV movies. It's the kind of day that brings rest to weary farmers who have been pushing to get their crops out of the field. And it's the kind of day that is a far cry from the sirens and storms that passed through our tiny slice of heaven just over a week ago. I can't describe the emotions a person feels while in the midst of a tornado warning or after seeing the destruction. My perspective has significantly changed since becoming a mother. The anxiety of the situation is nearly unbearable. All I could think about was getting my boy and grandmother to a safe place the second those sirens went off. Thank goodness for the early warning on that fateful afternoon, and kudos to the storm spotters. This is my first up-close experience with a tornado, and I hope it is my last. Unfortunately, the reality of the destruction doesn't really sink in until it happens to someone you know or someplace you drive by everyday. When you see things like this on TV, you might think to yourself for a few seconds or minutes, "Oh, those poor people, " but you can move on and be thankful that it wasn't you. 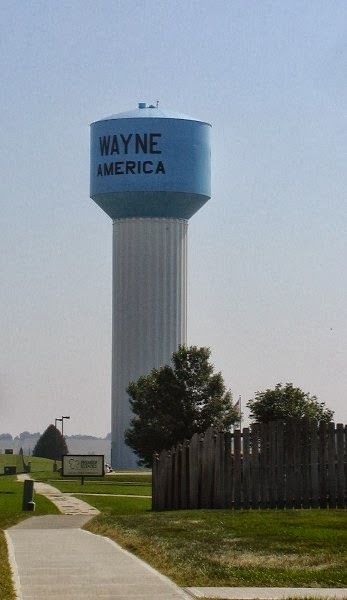 When those pictures of familiar places in and around Wayne started coming across the television, it was an entirely different story. Knowing that so many people were affected by the damage, yet not quite knowing what to do to help fix things is the worst feeling. I hate seeing the destruction. I hate that feeling of "where do we start?" Like most strong storms that pass through the area, you just want to spend the next morning cleaning up tree branches and anything else that wasn't strapped down and be done with the cleanup. Instead, there is a pit in bottom of my stomach that aches for the businesses and the families who have to assess the damage, who have to wait on insurance, who have to salvage what's left, and who have to rebuild. What made me stop to think about all of this was a visit with an old friend and neighbor lady on Friday evening while on my way home from work. She buys eggs from my mom and recycles our old copies of the Wayne Herald to share with her family and friends in other states. She had several close relatives affected by the tornado. During our conversation, she point blank asked me what I would do if I was them. Without hesitation, I said, "Rebuild." She cocked her head and looked at me like I was half crazy. Staring at each other, I thought, "What else would I do? Where else would I go?" Then, after thinking about it for a few seconds, she agreed that would be the best option. After all, this is the only life I've ever known. The farthest I've ever lived from the farm I grew up on is 10 miles. All of my immediate family, my husband, my son, my livelihood, and my home are all within a 10 mile radius. To me, the question is a no-brainer. For a life that's already been built, rebuilding should come as second nature. You can call me crazy, but this is my home. This is Wayne. This is our home, our life, our future. Things might look a little out of place right now, but I'm excited to see what the future holds for the numerous businesses ready to get back up and running. In a few months, I'm sure we will all like what we see in Wayne's Industrial Park and all along the path of the destruction. We will rebuild. Welcome Home. Stage One: Birth - When a home is first built, it has to go through a careful planning stage to ensure it has all of the right elements that it will need to withstand the test of time. In the early months and years of its life, the owner has to take care to nurture it and give it all of the personal touches that make it "grow" just right. With a new home, you are starting from scratch. Even after it is "born," it will take years of work to make it the home you want. Stage Two: Toddler to Adolescent Years - Like a human, a home begins to develop its own personality, attitude and characteristics that give it its very own identity. Just as children require a considerable amount of time and attention, you start to find that your home will need the right tools, landscaping, and routine maintenance to keep it functioning properly and in good condition. If any of these components are lacking, we might as well skip to Stage 6. Stage Three: Young Adult - As your home matures, it becomes a part of the community. The house finally finds its place in the neighborhood as the trees and landscaping become more established, playsets and yard sheds start to emerge and the interior gains more character with each color change to the walls. It becomes a haven for neighborhood children looking to play after school and for owners needing a place to relax and unwind. Stage Four: Middle Age - As the old saying goes, "things start going downhill at middle age." Major updates to a home are often considered at this point (dare I say "plastic surgery?") It might need a facelift of sorts to smooth out some of those wrinkles and blemishes left by weather and time. The addition of some new siding, a roof, HVAC, windows, or kitchen and bathroom updates are common during this stage. Remember, even though it might be an empty nest, a house still has a lot of life to live at this point. The grandkids are coming over to visit! Stage Five: Retirement - As a home enters its golden years, we all hope that the preparation stemming from the earlier stages are enough to keep it going like a well oiled machine well into its twilight. With routine maintenance and annual checkups to the major components, a home should be able to withstand even the most rigorous demands. That old house might even find that a new family is looking to call it home and breath some new life into it at this point. Stage Six: Death - Well, we all know what this means. Let's hope we go before the house does. No matter what stage your home is in, give me a call if you need advice on what to do to keep your home looking great and working well for your stage in life. I'm here to help if you need me. Welcome Home. Well, it's been almost a solid three months since I've been able to post anything. I bet most of you know why...there is a sweet little boy who consumes all of my free time these days, and I just can't get enough of him! Am I still selling real estate? You bet! I was back in the office just two weeks after the little guy was born. In my last post, I told you we would hit the ground running! The new joke here at the office is that I need to keep having kids because we have never been so busy as those few weeks I was gone for maternity leave! So, watch out Wayne! When the announcement for the next baby Peters comes, things are going to get wild and crazy with the real estate market! In the meantime, Logan has been getting an early start to his real estate career by helping mommy at the office here and there, listening in on important phone calls, and pounding out e-mail messages as only a 10 week old can (sorry for the typos if you happen to get one. He's just learning how to type.) Thanks to all for bearing with us during this special time, particularly my coworkers. (Although, I don't think they mind when the little guy is in for a visit!) We muddled through a few days just on the brink of consciousness as we adjusted to those midnight feedings, but we are getting a routine down as I continue to adapt to parenthood. Thanks for all the support! 1. Get prequalified for a loan NOW! In situations where multiple buyers are looking at homes and making offers, those with prequalification letters are considered more serious than those who haven't even spoken to their lender. When it comes right down to it, sellers want you to show them the money (or at least that you have access to it). This doesn't mean you have to lock in an interest rate and apply for a loan, you simply have to do some preliminary leg work to get a general idea of what you can afford. 2. 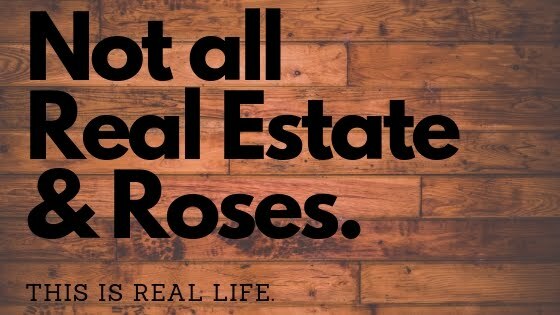 If you haven't spoken to a REALTOR, do so. Keeping an eye on the local paper and websites is helpful, but some properties are selling before they even make it to an advertisement. If you have your name on the mailing list, you won't miss a thing. E-mail is also a great way to stay in touch! 3. Be proactive. If you are unsure about what type of house interests you the most, look at a few in person or online to determine the features you can't live without. Make a list of everything your "dream home" would possess, then narrow that list to 3 or 4 things that any home must have. 4. Look at the big picture. Ultimately, your goal is to buy a home. A lot of times we get hung up on minor details like paint color, carpet stains, or cosmetic imperfections at a home. Try to look past those items to see the true potential a home holds for you. If you have trouble visualizing, ask your agent, a relative or close friend for their advice and expertise in regard to what can be done to solve the problem. A different perspective can make a big difference. 5. Be prepared. Things happen when you least expect them, so don't get caught off guard. Stay in contact with your lender and REALTOR even when nothing interests you on the market. If you currently own a home, ask your REALTOR to perform a market analysis to determine its value and give you advice about preparing the home to sell. Making an offer tied to a contingency to sell your current home can often make a contract look less attractive. Being able to tell a seller that you are ready for a quick sale might improve your odds of acceptance. I am more than happy to give you an idea of your home's value in today's market. 6. Don't get discouraged. The real estate market is always changing and evolving. Even though some homes are here today and gone tomorrow, it simply means that something better is waiting for you the next time around. Keep looking and stay in touch with your agent to make sure you have the latest information. Give me a call at (402) 375-1477 or e-mail tpeters@1strealtysales.com if you are in the market to buy or sell this summer. I look forward to working with you in the days and weeks ahead! Welcome Home. Ever since I was a little girl, I knew there was one job that I knew I was absolutely born to do. It wasn't being a real estate agent or a teacher or a doctor or an astronaut. I wanted to be a mom. That dream came true for my husband and me last September when we found out we were going to be parents. Now, we are t-minus 3 weeks from our due date and the reality is setting in! I am so thankful that I have felt great throughout the pregnancy, and our little one has been a very cooperative baby. Hopefully, it is a sign of all the good things to come! For those of you who have been wondering where I've been the past few days, we had a bit of a scare earlier this week at one of my regularly scheduled check-ups. My nurse discovered that my blood pressure had spiked over the course of just a few hours. Within moments, a team of doctors and nurses were in the room performing tests and monitoring Baby's response to the change. Needless to say, this soon-to-be mom was scared beyond all explanation! The doctor on call immediately put me on a blood pressure medication and ordered me to go home to rest with the stipulation that I was not to return to work until the baby is delivered. More panic immediately struck me as I realized that this was happening four weeks sooner than I had anticipated and I was leaving my coworkers, clients, and customers all in a bind. As we all know, things don't always work out as we plan. It is a blessing that we made it as far as we have without any major complications. The next day, I was doing everything in my power to try and "relax" at home while all this was weighing on my mind. Suddenly, I came to the realization that everything happens for a reason. For example, the snowy and rainy days are making it so much easier to watch the world go by from my picture window. The cold temperatures and rain also mean that my husband can't be out in the field planting corn or working on equipment, so he can focus on helping me at home. Since it is calving time at the farm, I have been comparing this experience to the things that I have experienced with my family on the farm. Our daily work with pregnant animals has provided much insight into how this process works. Sometimes we have a first-time mama that just needs a little more attention than the rest due to certain complications. It takes a certain amount of coaxing to make her realize that, but eventually, she calms down and accepts the necessary treatment. The cold and wet weather has made this an extraordinary year for calving with the babies needing lots of extra attention. I guess it just makes sense that mine would react in the same way! During this time, I have also realized that everybody who has ever had the privilege of becoming a parent understands the gravity of this situation. In fact, you all do. My coworkers are such a blessing, and they have refused to let me even set foot through the door at work for anything more than a social visit to keep them informed of what's happening with the baby. All of my clients and customers have been very understanding as we work through the dynamics of this unexpected change in plans, and for that, I thank each and every one of you for your support and kindness. I couldn't ask for a better job or a better group of people to work with. Our number one priority right now is to have a happy and healthy Baby Peters sometime within the next three weeks. The good news is that Baby is handling all of the non-stress tests like a little champ. If only its mom could do the same, we would be in great shape! I am so incredibly thankful for all of you and for the ability to be able to enjoy this special time before entering the world of parenthood. All of the preparations have been made and we are anxiously awaiting the arrival of Baby in hopes that we can once again hit the ground running. If anything, this little test has given me some insight into all of the unexpected surprises that come with parenthood, and has taught me the patience that comes with being a parent. My sincere appreciation to all of you as well as my husband, family, and friends who have generously offered to help in any way possible. Your phone calls, e-mails, and visits are making the time pass quickly until the day our little one is safely here. The doctors and nurses at Providence Medical Center have also been a godsend throughout this process. Their expertise and compassion for their patients is second to none. One of the greatest joys that I hope to ever have in this life is the day we welcome our little one into this world, and I can't wait to share that with you. Welcome Home! As you can see, the box sills are where the wooden frame for the home connects to the concrete foundation. This part of your home is generally located above ground to avoid infestation from termites and other wood destroying insects. Because it is not insulated by the soil, the temperature in the box sills tends to fluctuate more significantly with swings in the weather. This is also a place of considerable heating or cooling losses if not insulated like the rest of the walls in your home. 1. Most of the floor joists in your home are probably 16 inches off of center. This means, measuring from the center of adjacent floor joists, you will have a 16 inch span. Insulation companies make rolls of insulation to specifically fit into that size of space. 2. All you need to do is measure how "deep" the sill is. It is probable that your contractor used a 2 x 10 or 2 x 12 piece of lumber to construct the sill. 3. Insulation batts (pre-cut panels of insulation) work best for this job. They usually come in 8'-9' lengths and are faced with paper which is a vapor retarder. Cut your insulation pieces in 10-12 inch intervals. 4. Surprisingly, it works best to lay the insulation on a hard surface (i.e. concrete floor) with the paper side down. Using a utility knife, simply cut through the insulation being sure to press hard enough to score the paper on the other side so that it separates easily. 5. Insert the pieces into the box sills by pressing them into place. The pieces should fit snugly, particularly near the corners and edges. Try not to compress the insulation as this can affect the R-value of the insulation. R-value is a rating that indicates how much heat flow the insulation can resist. Often times, the paper should be facing out, particularly in areas that will be finished with drywall. 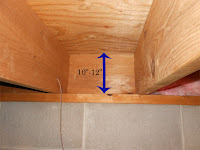 Since this space is an unfinished store room, the direction the insulation is facing is less important. Voila! Five simple steps later, you are well on your way to completing the insulation of all the box sills in your basement. Quite honestly, it is an easy do-it-yourself project, and one that I was able to accomplish in a short afternoon. Surprisingly, my husband immediately noticed a difference in the "draftiness" of the basement. So ladies, if you want to do something nice for your husband, buy him some rolls of insulation for Valentine's Day, insulate the box sills in your home and really impress the socks off of him! (He might even voluntarily take you out for supper as a reward!) Welcome Home. 1. Where do you bank now? Start there. Odds are that you have already developed a good rapport with your current lender, and he/she is very familiar with your spending and payment habits. Continuing a relationship with someone you are already comfortable with can make the process go much more smoothly than starting from scratch. 2. Have any of your close friends or family members recently purchased a home? If so, speak with them about their experience and see who they recommend using for a lender. Often times, your friends and family will gladly steer you in the right direction. 3. What type of loan are you looking for? Certain institutions might not offer FHA or USDA-Rural Development financing for qualified buyers. If you are a first-time buyer or income qualified buyer, you might want to ask up front about these programs during an initial visit with a lending institution. 4. Have you had credit issues in the past which might make it difficult to buy a home? If so, you might need to research options with a credit counselor prior to speaking with a lender. Consumer Credit Counseling Service in Norfolk is designed to help people get out of debt and improve their credit scores. Consider giving them a call at (402) 371-4656. 5. Have you checked into special housing programs offered in your community? Talk to your real estate agent or lender about down payment assistance programs or home rehabilitation programs which might be available for first-time or income eligible buyers. The Wayne Community Housing Development Corporation is designed to help income eligible buyers in the immediate area purchase homes by providing such assistance (acreages not included). The program offers 20% downpayment assistance (up to $20,000 maximum) for the average home as well as home rehabilitation services. The home must have a minimum of $1,000 worth of improvements that need to be made in order to qualify for the program. You can call Kari Wren, WCHDC's Executive Director, at (402) 375-5266 for more information, or stop in to visit her in the Wayne Area Economic Development office located at 108 West 3rd Street, Wayne. 6. 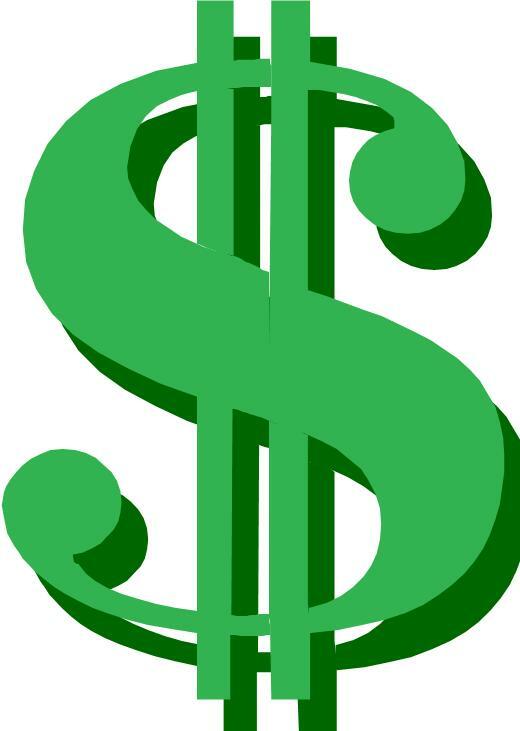 Do you have money available for a down payment or closing costs? Many home buyers have excellent credit, but are "cash poor" when it comes to putting money down on a home. If you are struggling with finding the cash to cover closing costs, inquire to your lender about the availability of Federal Home Loan Bank funds. These funds are earmarked for qualified buyers in need of financial assistance for upfront costs and are generally forgiven on a prorated basis over the course of several years. FHLB grants are typically only available at certain times in the year, for a very limited time, and availability is never guaranteed. To enhance your odds of getting assistance, be sure to bring this up to your lender early in the mortgage process. 7. Check into loan options prior to starting your home search. Once you make the decision to purchase a home, it can be hard to resist the urge to look at several before even speaking to a lender. Many buyers start looking for homes with high expectations of what they can truly afford. To eliminate the disappointment of falling in love with a home that is priced above your means, talk to a lender first. Having a solid idea of what you can afford will allow you to comfortably look at homes in your price range. It will save both you and your real estate agent time in the long run. 9. Shop around. If an initial consultation does not go well with a lender or if the mortgage rate seems higher than other banks, feel free to do some additional homework. Sometimes personalities clash or the relationship just doesn't feel right. Be sure you feel comfortable enough to ask your mortgage lender anything and everything you want to know about financing a home purchase. Remember, this is a big step in your financial life, and you will most likely be doing business with this bank for several years into the future. 10. If you have any further questions about decisions relating to home financing decisions, feel free to contact me at (402) 375-1477 or tpeters@1strealtysales.com. Welcome Home. New Years Day 2012 was spent working on demo projects, while, ironically, New Years Day 2013 was spent putting pieces back together. The trim we had selected for our home was on back order when we started the first round of installation. The extra pieces we needed finally came in sometime around August. Amazingly, we found the time to get things wrapped up roughly five months later. We were successful in completing the installation of the baseboard, door and window trim in the final two rooms on the main floor with a little help from my husband's folks, my brother, and the nifty finish nail gun my husband got from Santa this Christmas (like a kid in a candy store). This means that the home office that I "just had to have" is finally ready for some work to be done, with the exception that the window treatments have not been installed. As of right now, the desk is still sitting in the middle of the room amongst a jumble of paperwork that needs to make it to the accountant. In the next few weeks, we have duct cleaning on the agenda as it is time to rid the house of all of the construction dust and dirt that accumulated throughout the year. I'm hoping that we will notice a difference in the amount of particles floating through the air and settling on the furniture. Kleinschmit Air Duct Cleaning of Wausa will be helping us with this project. Turns out the owner is related to some friends of ours so he is able to make it a dual-purposed trip--small world! "When in crisis mode, think to yourself, 'In five years, will this really matter to anybody?' If not, don't sweat it." Is 2013 the Year to Buy or Sell a Home? A recent report in HousingWire magazine indicates that the nationwide housing inventory was down 27 percent as of December 2012 from December 2011 figures. The Wayne area is experiencing a similar phenomenon with declining housing inventory levels as buyers continue to search for a variety of homes in all price ranges. Buyers and sellers needing to make a move due to changing familial status, health issues, job changes, and a variety of other reasons are having difficulty securing properties to meet their needs in Wayne or other market areas. First-time homebuyers and move-up homebuyers are struggling most significantly at this point to locate home listings that satisfy their needs and wants. The National Association of REALTORS (NAR) is predicting that increasing rental rates will continue to drive homebuyer traffic as many people find that home mortgages are actually more affordable than the rising cost of rent in many areas of the country. Several families in Wayne are finding this to be the case as well. This is being fueled by low mortgage interest rates as well as favorable conditions for obtaining home financing in rural areas. The USDA-Rural Development and FHA loan programs continue to be popular loan products for first-time buyers and many local lenders. Several first-time buyers are also seeking downpayment and rehabilitation assistance from programs such as the Wayne Community Housing Development Program or Northeast Housing Initiative. According to NAR, solid demand for homes in 2013 is predicted to drive home sales up and improve prices across the board by roughly one to two percent, which is great news for sellers. Home sales will also increase if bank underwriting standards return to normal levels as rising home prices improve collateral values for banks. However, pending Federal legislation threatens to make it more difficult for lenders to finance buyers, which will affect home purchasing decisions. Since starting at 1st Realty in 2004, the number of home listings on the residential market is at the lowest level that I can remember. The market is certainly trending towards a seller's market. Buyers will testify that there is not much selection to pick from in today's marketplace. In particular, several move-up buyers have commented on the lack of inventory available between $125,000 and $200,000. Unfortunately, this has been the case for several months. Much of this phenomenon can be largely attributed to the cautious optimism that is accompanying the U.S. economic situation. Economists predict that many buyers and sellers have been biding their time in order to determine what the fiscal cliff debate means for them in 2013. With the promise of higher taxes and fewer deductions, many people have decided to stay in their existing home longer in hopes of avoiding financial problems in the future. With all this in mind, 2013 is indeed the year to sell your home. Limited inventory means limited competition from other home sellers as well as the benefit of increased buyer traffic. Many buyers in today's market are prequalified for loans and have money available for downpayments and closing costs. Several qualified buyers are also in the market to make immediate purchases as they are currently renting and do not have to wait on home sale contingencies. As opportunities arise, 2013 will also prove to be the year to buy a home. Interest rates continue to be favorable for buyers as they hover near all time lows. Although the looming threat of higher taxes is always upon us, the good news is that the mortgage interest deduction survived the fiscal cliff and is still available for homeowners. As mentioned, many economists predict that housing prices have hit their lowest point and will start to appreciate in rural areas between one and two percent each year. If you have questions about the local housing market, contact 1st Realty at (402) 375-1477 or e-mail me at tpeters@1strealtysales.com. Whether you are in the market to buy or sell a home, farm, or commercial property, 1st Realty can provide you with the advice you need to make 2013 your year to buy or sell! Welcome Home.